The Wallow fire closed in on Eagar, Arizona. In May 2011, huge wildfires started to blaze across parts of the southwestern United States. The Wallow fire in eastern Arizona quickly became the largest wildfire in the state’s history. Authorities believe that an abandoned campfire started the blaze. The Wallow fire burned more than 800 square miles of land. Many forest animals, such as black bears, deer, and elk, had to flee for their lives. The fire was so big that smoke could be seen from as far away as Nebraska, Kansas, and Iowa. As the Wallow fire came closer to Springerville, Eagar, and other Arizona communities, thousands of people had to evacuate. When the fire crossed the Arizona border, the people of Luna, New Mexico, also had to leave their homes. Some people went to stay with friends or relatives in safe places. Others stayed in shelters that were set up in schools. Since many shelters did not allow pets, many families had to leave their pets in animal shelters. Even for people who did not have to evacuate, the fire caused problems. Firefighters had to shut down major roads and highways because of the flames and smoke. Some people were without power in their homes. Firefighters worked hard to keep people and their property safe. However, the fire still destroyed 32 homes. After they were allowed to return to their homes, people were still affected by the Wallow fire. The smoke and soot in the air was dangerous to their lungs. They wore bandanas or masks over their faces to protect themselves. Many homes that survived still suffered damage from the fire and smoke. With the help of volunteers and donations, people are working to recover and rebuild their communities. Learn how to prevent wildfires from Smokey Bear’s activities, games, and facts. Find out how to prepare for disasters using these tips, activities, and games. What was the largest wildfire in the history of Arizona? 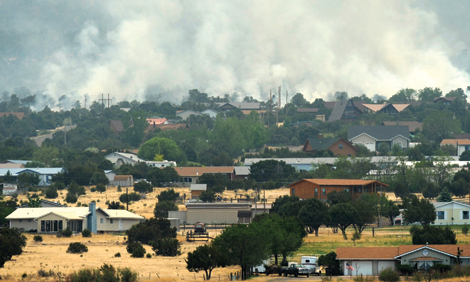 Which city in New Mexico had to be evacuated because of the Wallow fire? Why did people wear bandanas and masks when they returned home?